Spiders can fly long distances by releasing long strands of silk, which get picked up by the wind. 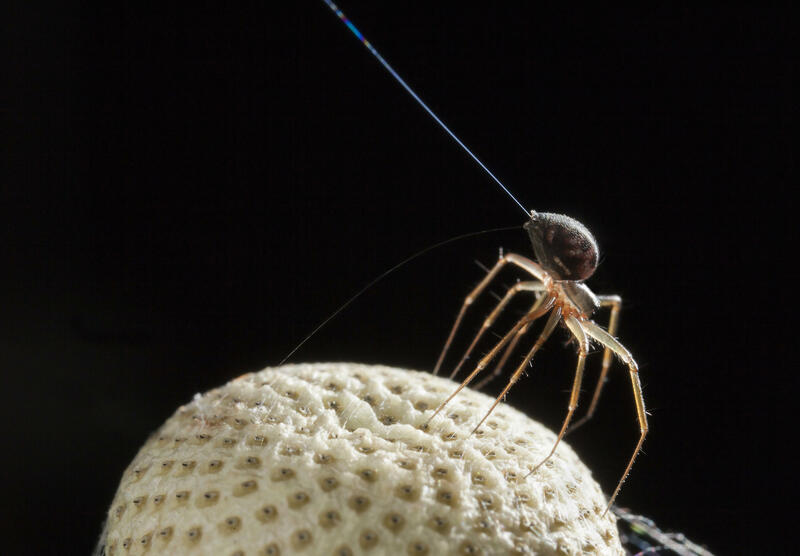 Ballooning spiders have long fascinated scientists because they fly high — they've been found more than 2 miles up — and far. These spiders land on ships in the middle of the ocean, and they're often the first colonizers of new volcanic islands, says Erica Morley of the University of Bristol. "Although they don't have wings, they're actually pretty good at flying," says Morley. She explains that a spider will go to a high branch on a tree or to the top of a tall blade of grass and stand on tiptoe with its abdomen pointing up. It then releases long strands of silk and becomes airborne. Curiously, Morley says, spiders balloon only when the winds are very low, like a light breeze. And some larger spiders manage to get up in the air even when it seems like there's not enough wind to make that happen. Scientists also wonder what triggers mass ballooning events — when thousands of spiders suddenly take to the air. All of those are hints that spiders rely on something more than just the wind. What's more, ballooning silk is made of lots of strands that are released at the same time, "and these sort of splay out, as though there's a repulsive force present," Morley says. The idea that atmospheric electric fields might affect flying spiders has been around since the 1800s, but until now, there's been no evidence that spiders could detect or use them. Morley and her colleague Daniel Robert got interested in this after reading a recent paper that showed electrostatic spider flight was theoretically possible. "There wasn't actually any empirical data to support or dispel this hypothesis so that's what we tackled," Morley notes. They rigged up a box with two metal plates, one on the top and one on the bottom. The top plate was connected to a voltage, and the bottom one was electrically grounded. "So between the two plates was an electric field," says Morley. "And the spiders were then put in this electric field, and we could switch it on and off and look at changes in their behavior." The spiders reacted when the electric field was switched on. "They try to balloon. They perform this tiptoeing behavior, and try to balloon," Morley says. "I was delighted when I saw them responding. It's very surprising. It needs a lot more investigation." Some spiders even became airborne in the lab. "And you can change their altitude by switching the electric field on and off," Morley adds. "If they manage to become airborne, and you switch the electric field off, they will then slowly fall. And then you can switch it back on again and they will rise. So you can see that this electric field is providing enough force to lift them against gravity." She says there's a lot more work that needs to be done to see how this plays out in a natural environment, and how this relates to their use of wind. "Wherever there's an electric field in the spider's natural environment," she says, "there is also likely to be some air movement."